Each year on February 24, 2015 World Spay Day takes place. Humane Society of the United States encourages nationwide, as well as worldwide clinics, to offer free or low cost spay and neuter services in order to increase education and availability to pet owners. 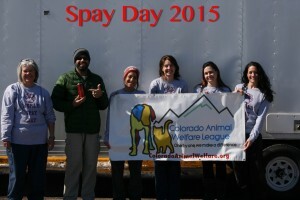 This year, as in previous years, Colorado Animal Welfare League was able to participate in World Spay Day. Our trusty and adventurous mobile unit, the SNOWmobile was able to join forces with Dumb Friend League’s own LuLu Mobile and Meow Mobile to offer free cat spay and neuters. Joining together we were able to offer spay and neuter surgery, as well as vaccinations, to 72 cool Colorado cats. Helping to provide these cats with longer healthier lives and preventing unwanted litters. Thank you for HSUS for adding such great recognition to World Spay Day each year and for allowing so many of us to get together and offer more spay and neuter services within our communities. Thank you to all the excellent volunteers that help us make this event possible and the donors that recognize the importance of spay and neutering our pets.